Out of home consumption has been on the increase for years now; snacks and food-to-go have become a part of everyday life. At the same time, the awareness of balanced nutrition is growing. With its power snacks at iba 2018, backaldrin proves that these trends are not mutually exclusive. But it’s not just the snack bar that is packed full of power – guest appearances by the athletes of the Kornspitz Sport Team also bring plenty of power to the stand. Bread and rolls are the ideal base for the widest variety of snacks. Six backaldrin products show just how quickly and easily trendy bites can be created. While classic Original Kornspitz, Kurkuma ciabatta, new Aronia mini baguettes and the knotted Urkorn roll are impressive choices, Actipan® and “MyUrkorn” make it clear that great snacks can also be made with wholegrain breads. In cooperation with the company bsc, which offers training, consultancy and concepts for bakeries, backaldrin has developed different creations to ensure that there is something for every taste. “We want to show how versatile our products are and what is possible with them as a base,” explains backaldrin Managing Director Harald Deller. The six presented ideas are merely a suggestion. When developing snacks, everyone can get creative and implement ideas specifically for their bakeries and customers. The varied recipes are prepared on-site at the snack bar on the backaldrin exhibition stand, so that the production can be experienced and questions can be asked. Of course, the freshly prepared snacks are also available for tasting. All recipes are suitable for preparing in advance and selling at the counter but they can also be quickly and easily made on demand. 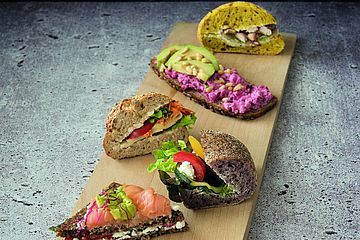 With their fresh toppings and based on a variety of baked goods, the snacks provide power and new energy. The Aronia mini baguette is a feast for the eyes; wholesome grilled vegetables harmonise with cream cheese, oakleaf lettuce, crumbled feta and the lightly fruity taste of the power berry, aronia. 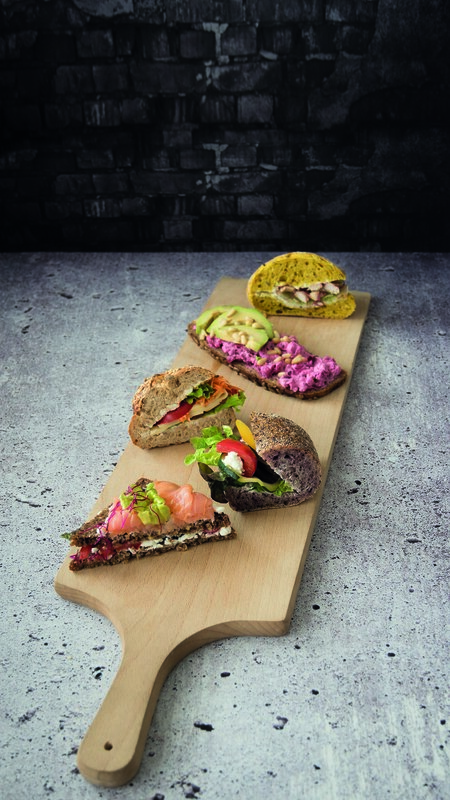 The succulent “MyUrkorn” wholegrain multigrain bread becomes a light and refreshing treat with cottage cheese, smoked salmon, tomatoes, radishes, lettuce and sprouts. Actipan®, the wholegrain bread for athletes and active people, combines a beetroot spread with trendy avocado and is rounded off by crunchy pine nuts. The knotted Urkorn roll, which brings together the power of emmer, einkorn, spelt and wild rye, is ideal for all cheese lovers; grated carrots add that little extra. In the Kurkuma ciabatta, the typical taste of turmeric is complemented by the basil seeds and oilseeds in Sabia, making a perfect base for cream cheese, salad and chicken strips. A Mediterranean-inspired Original Kornspitz, with rocket, Serrano ham and radish sprouts, completes the snack range at the backaldrin counter. From Sunday to Wednesday many different athletes will visit the stand. German biathlon stars Laura Dahlmeier, Arnd Peiffer, Erik Lesser and Maren Hammerschmidt, as well as Austrian counterparts Simon Eder and Julian Eberhard, and Russian biathlete Ekaterina Yurlova will also be there. Sprinter Tatjana Pinto and gymnast Tabea Alt from Germany, former gymnast and Olympic champion Fabian Hambüchen, together with former biathletes Magdalena Neuner and Martina Beck and former Russian ice hockey star Vyacheslav Bykov will also be on site. The sports stars will be available for autographs between 16 and 17 o’clock and will then be at the sports bar for talks and souvenir photos at the “Magic Mirror” photo station.